When the outbreak happened, Lab 51's alarm immediately alerted the police station, which was only five minutes' walk away. Officer Robin and his squadron were the first to arrive and helped a number of researchers escape from the lab. They also lured a large number of zombies to the police station, thinking the surroundings and arsenal could contain the zombies, but it wasn't the case; in the end, the police blocked the road to hold off the zombies while they escorted the researchers to safety. Robin even managed to escape from the scene with Marian and took her to Tower 101. That's taken directly from Chapter 4 of the Zombie Lab story, because for once it had something in-depth and yet easily soundbiteable to say about one of the characters in the set. Robin is a cop, here's what the cops did, here's how it turned out. The end. That's all we're asking! Zombie Lab is set in Hong Kong, which means you can learn a lot just by looking things up; that's how we knew, for instance, that Zoe's school uniform looked nothing like it should. But it's not just about finding out what's wrong, it's also about finding out what's right - like the way that Robin, here, is dressed pretty much the way a Hong Kong police officer should be, with a light boue shirt and dark pants. 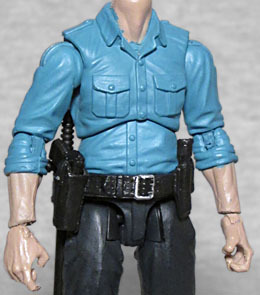 Now, we could get really nit-picky and point out that the sleeves should be shorter, the epaulets should be painted as dark as the pants, and the word "POLICE" should be just above the left breast pocket, but this is still a great 4" scale policeman. Officer Robin gets a new head, with close-cropped hair. The face looks rather like Mark Dacasos, with those intense eyes and strong cheekbones. Guy's been acting since 1989, he's probably played a cop at least once, right? Or swap this head onto a body wearing a suit, and create your own Iron Chef America version of Chairman Kaga! The Zombie Lab figures are built using the Vitruvian HACKS Character Kit System, so they have excellent articulation: a balljointed head and neck; swivel/hinge shoulders, elbows and wrists; a balljointed torso; balljointed hips; double-hinged knees; and swivel/hinge ankles. A few of the joints here were slightly stiff - the elbows, definitely - but nothing broke when I tried to move it. It just took a little care and patience to get things to shift the way they should. 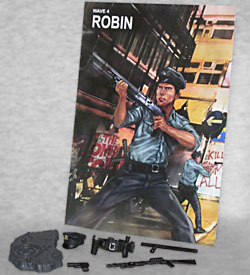 Beyond the standard display base and the art card with Chapter 4 on the back of it, Robin has perfectly police-like accessories: there's the belt, of course, which plenty of other figures have come with, and the pistol to go in it, but he's also got a nightstick that can slide into the loop on the back, and a tactical shotgun for taking chunks out of zombies. To complete his uniform, he even gets a removable cap. Yes, it looks a little too large on his head, but there isn't really a way around that at this scale. 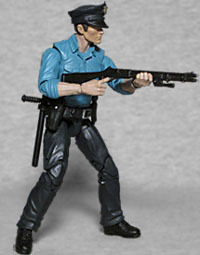 Even if you're not interested in Zombie Lab at all, a plain police officer in this scale is something cool. They could have added a few more paint apps to really make it awesome, but not being the best possible doesn't mean it's not good.